Almeria - Portus Magnus of the ancients, Air Meryah, Arabic, "the conspicuous". Under the Moor it was the "great port" of traffic with Italy and the East, and one of the richest manufacturing towns. Under its Moorish independent chief, Ibn Maymtin, it was a perfect Algiers, a pirate port and pest, whose galleys ravaged the coasts of France and Italy. Then, according to the proverb, Granada was merely its farm "Cuando Almeria era Almeria, Granada era su alqueria". In 1891, during the construction of a railroad, the remains of a Copper Age settlement were found 17 miles north of Almeria. It was a sizeable one: it had walls and it housed a thousand inhabitants. 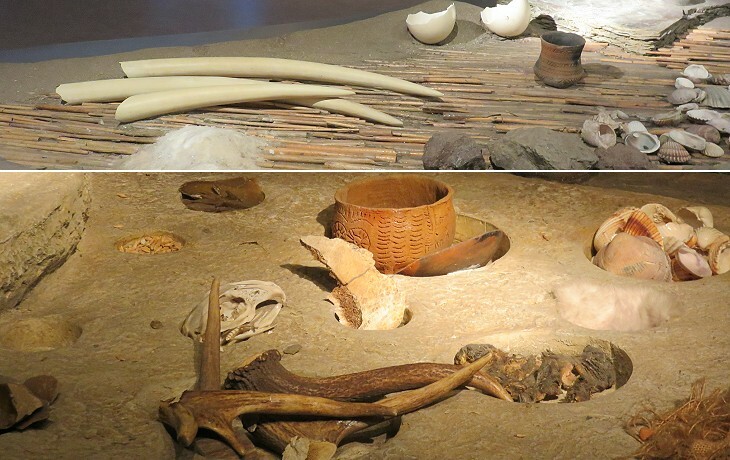 Some of its tombs contained elephant tusks and ostrich eggs; these were imported as luxury items from Morocco, which indicates the existence of early trade routes between Spain and Africa. Ford indicated Almeria as being ancient Portus Magnus. 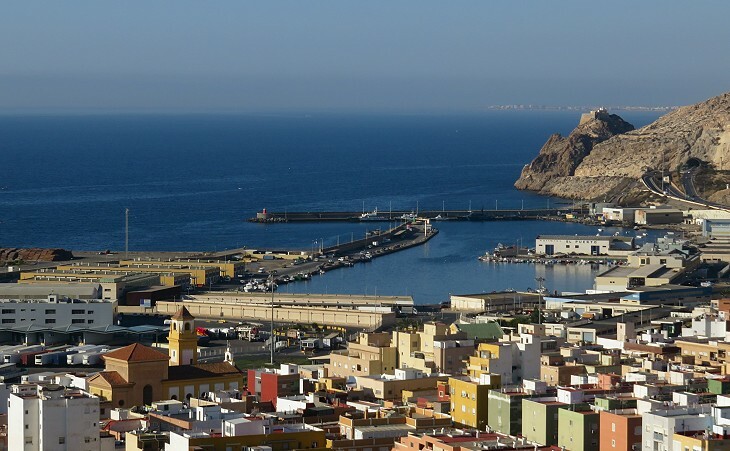 This harbour is actually mentioned by Pliny the Elder, but in Algeria opposite Almeria. 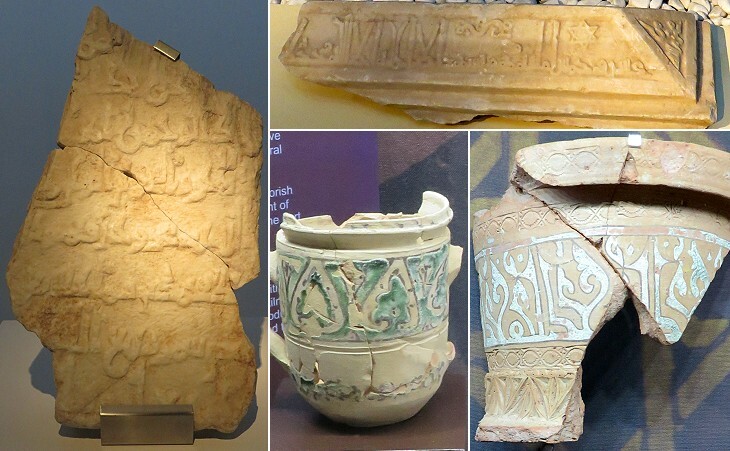 As a matter of fact archaeologists have not found evidence of Almeria being a major settlement when the Romans ruled Spain. Historical records suggest that Abdera was the main port of this coast on the Mediterranean Sea and that, similar to Baelo Claudia on the Atlantic Ocean, its economy was based on tuna fishing and garum (a fish sauce) manufacturing. 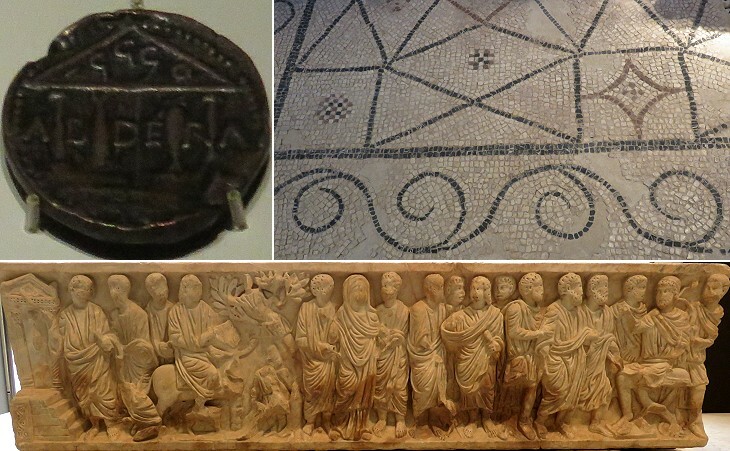 Some of the exhibits of the Roman period at the Museum of Almeria suggest the region enjoyed some degree of wealth. 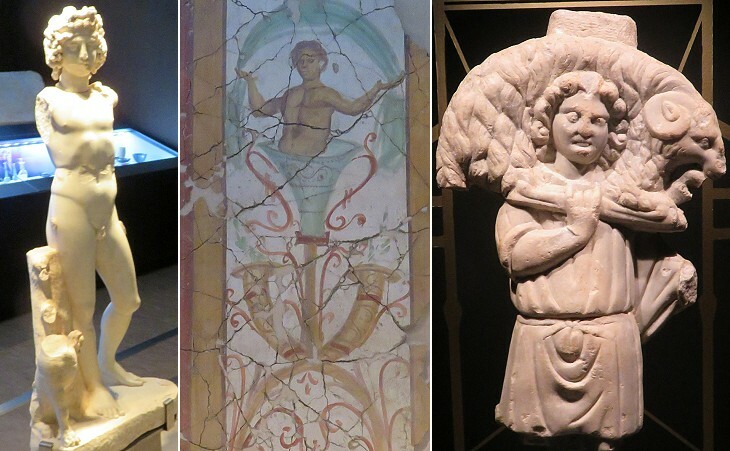 Marble sarcophagi and statues were imported from abroad and skilled painters and mosaic makers were involved in the decoration of houses and public facilities. 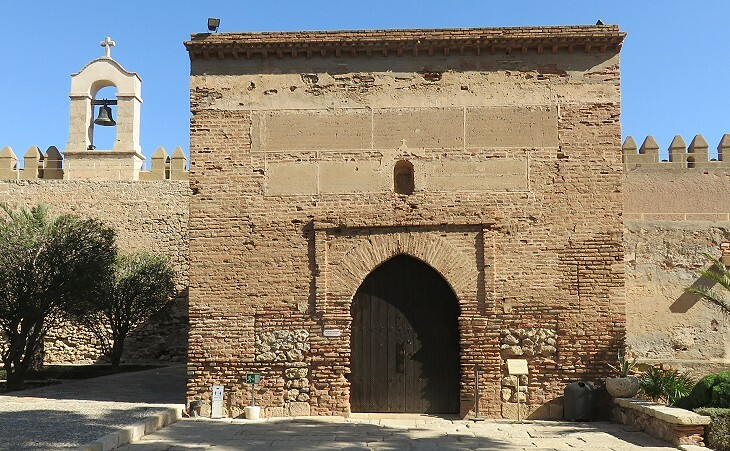 The inscription says that the town was founded in 954-955 by Ibn Rumahis, Admiral of the Fleet of Abd ar-Rahman III, Caliph of Cordoba. 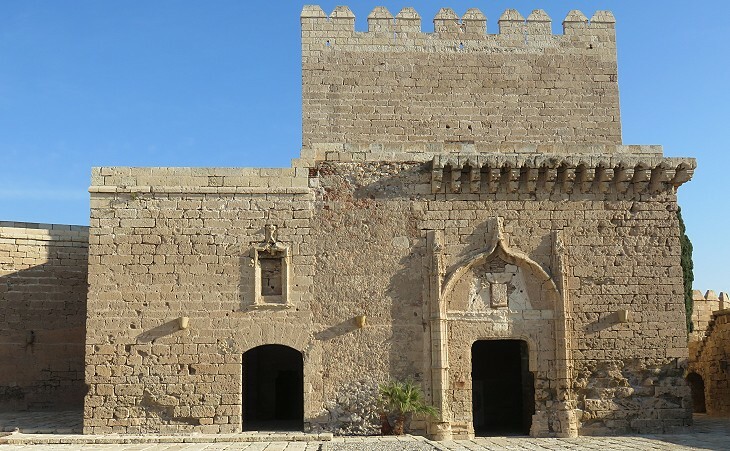 The decision to found a new port for the fleet at Almeria shows that the Caliph was worried that the Fatimid rulers of Ifriqiya (Tunisia) could threaten an invasion of Spain or support a revolt, as they had already done in the early Xth century. Behold, my lords, so many spears erect / With flags of Almerian silk bedecked! The Song of Girart of Vienne by Bertrand de Bar-sur-Aube - translated by Michael A. Newth. Virtually the whole world knows that over a long period in the past Christians were taken captive far and wide by the Saracens of Almeria on land and at sea in many parts of the world: some were killed, many were cast into prison, and they were subjected to the agony of many different forms of martyrdom and torture. As a result of these sufferings many, for fear of torture, used to renounce the law of God and invoked the diabolical name of Muhammad. This is why, at the end of the day, God did not neglect to punish the shedding of so much blood. The Genoese, counselled upon by God through the Apostolic See, swore in those who fould fight in an army against the Saracens of Almeria. From Caffaro di Rustico - Ystoria captionis Almerie et Turtouse, a Genoese chronicle of the events which led to the conquest of Almeria by a joint Christian expedition in 1147 - Translation by Martin Hall and Jonathan Phillips. A third of the town was given to Genoa, but both the kings of Castile and the maritime Republic of Genoa were not interested in holding Almeria indefinitely. In 1157 Almeria was conquered by the Almohad rulers of Morocco who imposed their rule on the Muslim territories in Spain. In 1212 the Almohads were defeated at the battle of Las Navas de Tolosas and in the following period they lost many of their possessions and in particular Seville which was conquered in 1248 by King Ferdinand III of Castile, the Saint. Profiting from the Almohad route, the Nasrid emirs of Granada managed to annex Almeria to their kingdom. The old king El Zagal, uncle of Boabdil, the new king of Granada, buried himself in the recesses of his castle to hide himself from the light of day which no longer shone prosperously upon him, but every hour brought missives thundering at the gate with the tale of some new disaster. Fortress after fortress had laid its keys at the feet of the Christian sovereigns. (..) Scarcely a remnant remained to him except a tract of the Alpuxarras and the noble cities of Guadix and Almeria. (..) El Zagal was seated on his divan, his whole spirit absorbed in rumination on the transitory nature of human glory, when his kinsman and brother in law the Prince Cidi Yahye was announced. That illustrious convert to the true faith and the interest of the conquerors of his country had hastened with all the fervour of a new proselyte eager to prove his zeal in the service of Heaven and the Castilian sovereigns by persuading the old monarch to abjure his faith and surrender his possessions. (..) Cidi Yahye urged El Zagal to make a frank and entire surrender. "Trust" said he "to the magnanimity of the Castilian sovereigns. They will doubtless grant you high and honourable terms. It is better to yield to them as friends what they must infallibly and before long wrest from you as enemies for such my cousin is the almighty will of God." "Alahuma subahana hu!" repeated El Zagal "the will of God be done." So the old monarch bowed his haughty neck and agreed to surrender his territories to the enemies of his faith rather than suffer them to augment the Moslem power under the sway of his nephew. (..) On the 17th of December King Ferdinand departed from Baza with a part of his army and the queen soon followed with the remainder. Ferdinand passed in triumph by several of the newly acquired towns exulting in these trophies of his policy rather than his valour. As he drew near to Almeria the Moorish king came forth to meet him accompanied by the Prince Cidi Yahye and a number of the principal inhabitants on horseback. (..) As he approached the Christian king he alighted from his horse and advanced to kiss his hand in token of homage. Ferdinand however respected the royal title which the Moor had held and would not permit the ceremony but bending from his saddle graciously embraced him and requested him to remount his steed. 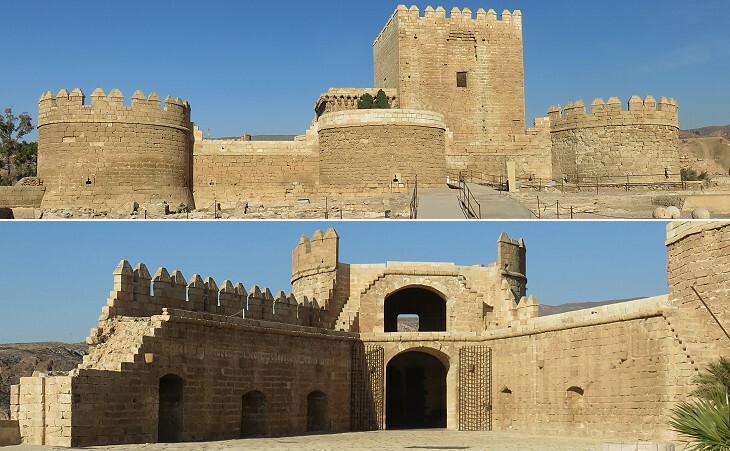 Several courteous speeches passed between them and the fortress and city of Almeria and all the remaining territories of El Zagal were delivered up in form. When all was accomplished the old warrior Moor retired to the mountains with a handful of adherents to seek his petty territory of Andaraxa to bury his humiliation from the world and to console himself with the shadowy title of a king. 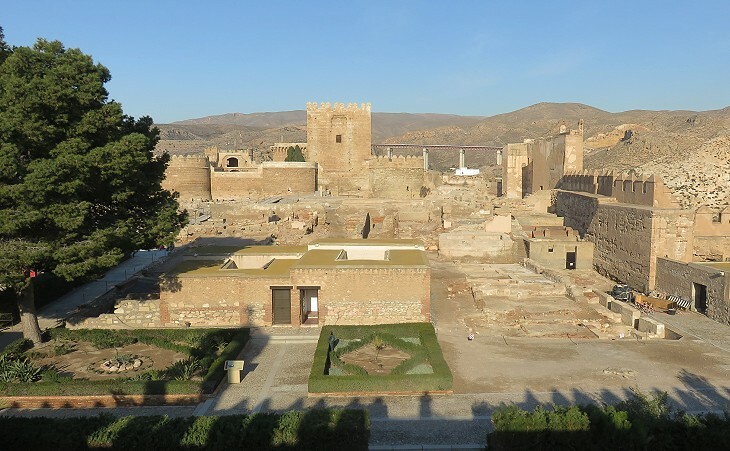 In 1522 a major earthquake struck Almeria; while most of the massive walls of the Alcazaba withstood its effects, the buildings inside were greatly damaged. The mosque of the fortress had already been turned into a church, but most likely it retained some of its Moorish decoration. Today only the portal is vaguely reminiscent of the original building. This large tower was part of the Nasrid enlargement of the fortress; similar to the towers of the Alhambra it is named after someone who lived there. 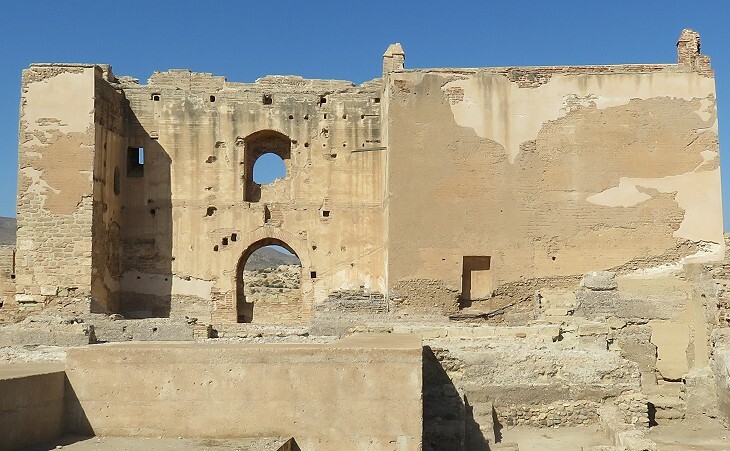 According to the legend, at the time of the Taifa of Almeria, Galiana, an odalisque, used to spend her time admiring the landscape from the large window of this tower. Her beauty raised the attention of a young Christian slave who dedicated her songs and poems. He eventually tried to climb the tower, but was noticed by the guards and chose to jump to death. When Galiana learnt about the fate of her admirer she fell into a depressive mood and she refused to sleep or eat or drink and after a week she died. You may wish to learn something about Bella Galliana of Viterbo. The fortress of the Moors was also a residential palace, but after its conquest by Ferdinand of Aragon, its military purpose became predominant. The Spaniards in 1509 conquered the town of Oran in Algeria and Almeria was the nearest port to it, thus it acquired a major military importance. The Spanish sea supremacy in the western Mediterranean was challenged in the 1530s by Hayruddin Barbarossa, an Ottoman admiral who raided the coasts of Italy and Spain. 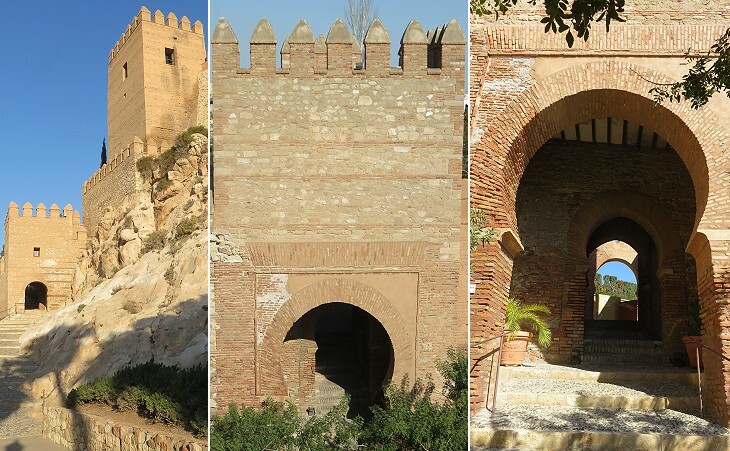 New state-of-the-art fortifications were added to the Alcazaba to protect Almeria from this threat. Similar initiatives were taken in that same period in other coastal locations (e.g. at Milazzo in Sicily) and even in Rome. The keep retains a portal in the Isabelline style, that which prevailed in the Kingdom of Castile in the XVth century. 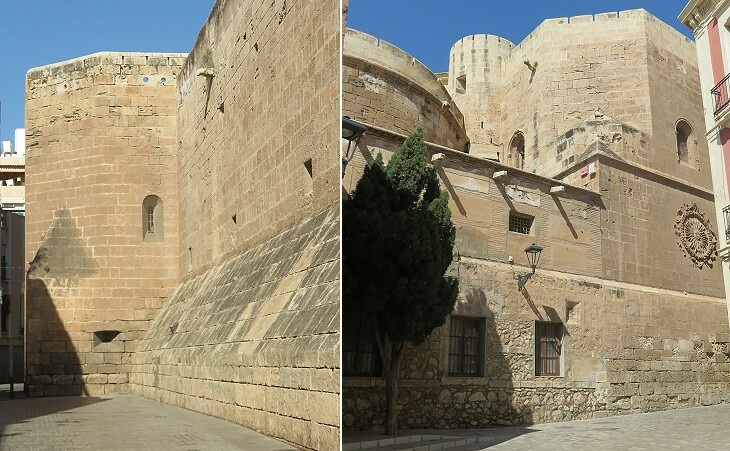 It indicates that the keep was built soon after Almeria was surrendered by the Moors. It was the residence of the governor of the fortress and it was designed for a last defence. Its height is best seen in the previous image. The fortifications of Almeria were complemented by walls which linked the Alcazaba with the harbour. In 1885 they were demolished because they were no longer needed from a military point of view and they hindered the development of the modern town. Two towers however were left standing because their tapia construction technique indicated that they were built in the Xth century when the town was founded. The walls at the back and beyond La Olla (a ravine) are very picturesque, running up and down the declivities. Ford. 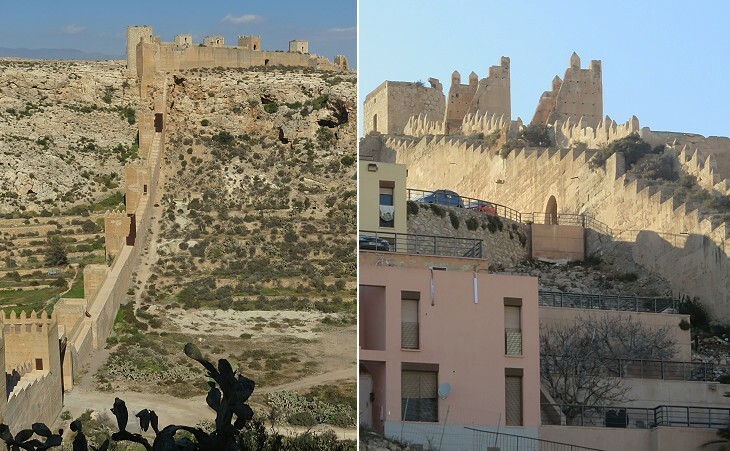 These imposing walls were built by Jayran, the founder of the taifa of Almeria; they show that he feared the town could be attacked by an army coming by land. 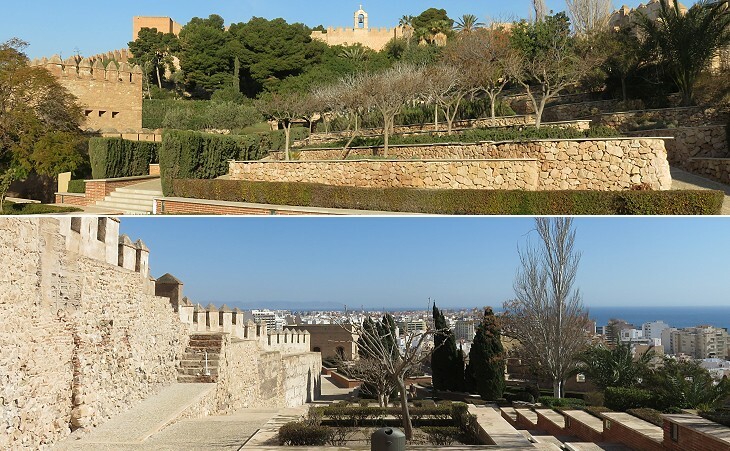 After reaching the top of a hill (Cerro de San Cristobal) opposite the Alcazaba, the walls went down to completely surround the town, but their final section does no longer exist. 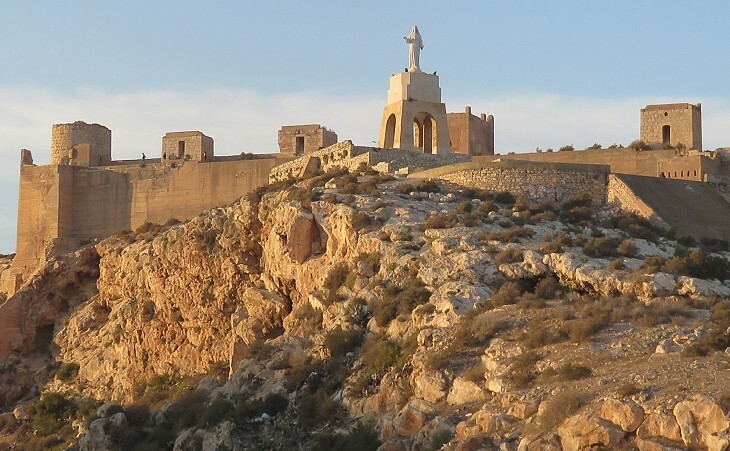 During the 1147-1157 Christian occupation of Almeria a castle named after Saint Cristopher was built on the hill. It gives the name to the site where in 1930 a gigantic marble statue of Jesus Christ in the act of blessing the town was erected. In addition to taking care of the fortifications of Almeria, Jayran dug a long channel which carried water to a series of large cisterns from which it was distributed to the fountains of the town. 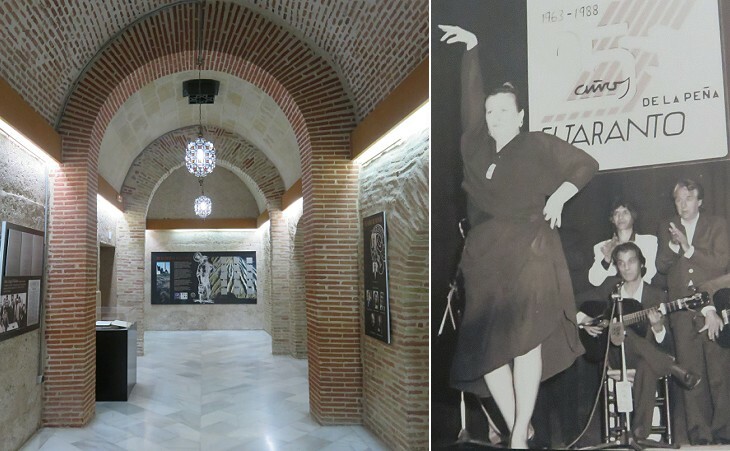 Today these cisterns house Peña El Taranto, a flamenco club. 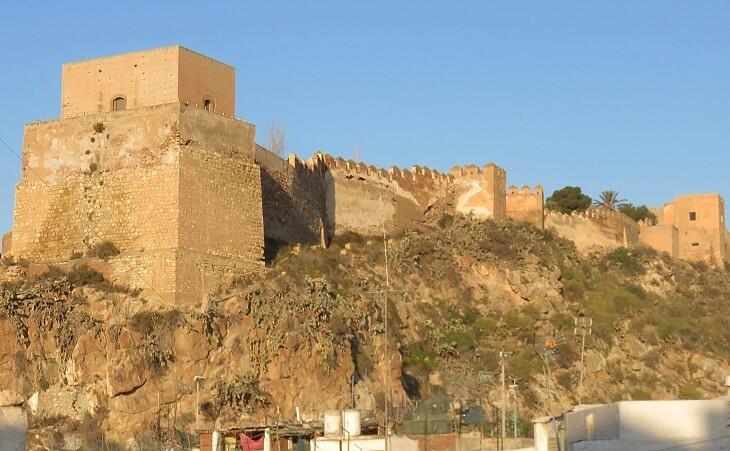 The Castle of Colahorra was built by Rodrigo de Mendoza, who took part in the 1492 conquest of Granada, in order to control the Alpujarras, a mountainous region between Almeria and Granada where many Muslim inhabitants fled after the Christian conquest of their towns. 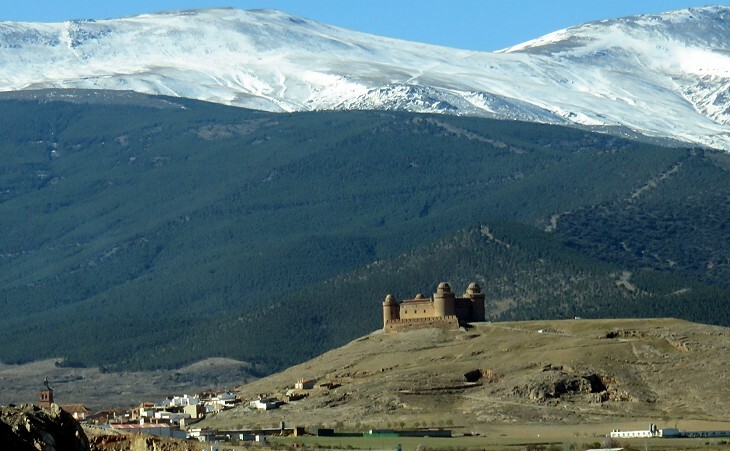 The castle was a Spanish stronghold during a major Muslim rebellion in 1568-1571. 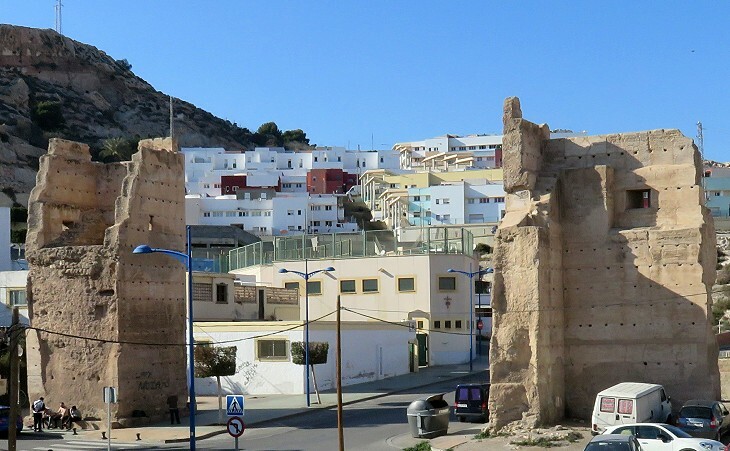 The expulsion of the Muslims inhabitants of Almeria led to the destruction of all their religious monuments. 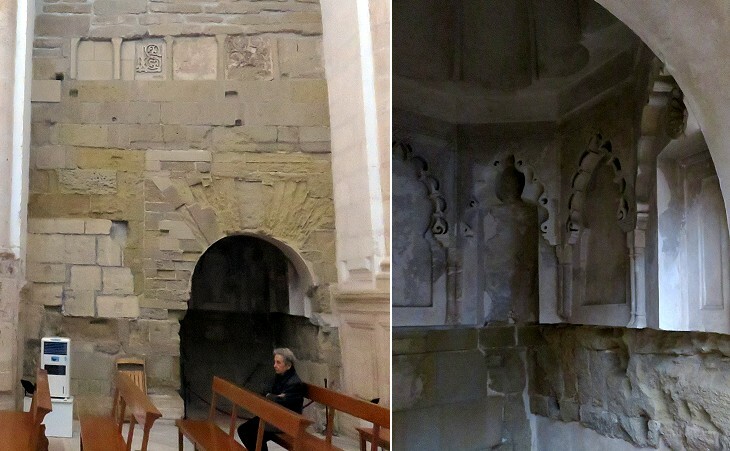 Some traces of Moorish architecture of the Almohad period can be seen in a church which replaced a former mosque at the foot of the fortress. 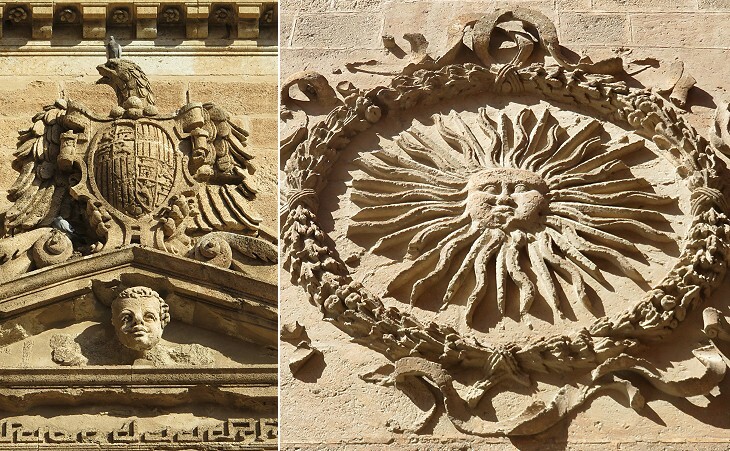 Its remaining Moorish walls and decorations were made visible again by a restoration in 1991, after their existence had been discovered in 1930. The collection of Islamic exhibits at the Museum of Almeria is rather limited, notwithstanding the long occupation of the town by the Moors. Of particular interest is a relief where human beings are portrayed. Its features are those of a Christian medieval work, perhaps by a Christian slave or convert. 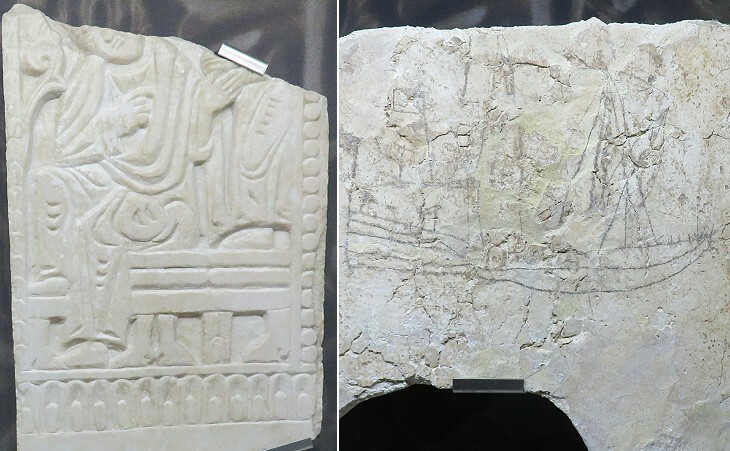 While the prohibition of portraying human beings was strictly complied with in mosques, there are residences of Muslim rulers which were decorated with reliefs (e.g. at Konya) or frescoes (e.g. at Qasr al-Hamra in Jordan and Isfahan) which depicted human beings. 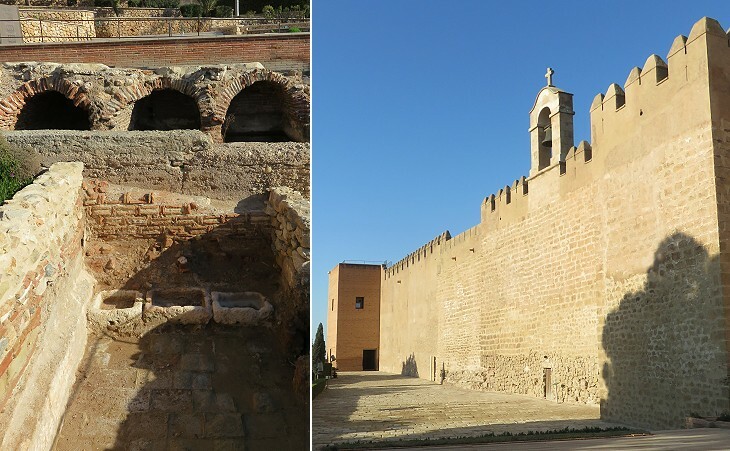 The Cathedral was built after the devastating 1522 earthquake at some distance from the Alcazaba. For this reason its design included loopholes for musketry and sloping walls which made placing scaling ladders more difficult. You may wish to see Basilica della Santa Casa at Loreto, another church which was fortified because of fear of an Ottoman attack.